"... I obtained from God for the Church the Pope who had been prepared and formed by me. He has consecrated himself to my Immaculate Heart and has solemnly entrusted to me the Church, of which I am the Mother and Queen. In the person and the work of the Holy Father, John Paul II, I am reflecting my great light which will become stronger, the more the darkness envelops everything" (January 1,1979). For this purpose Fr. Gobbi has traveled throughout the world holding Cenacles of Prayer on every continent. Cenacle refers to the gathering of the apostles around the Blessed Mother in the Upper Room in which the Last Supper was celebrated and in which they awaited the outpouring of the Holy Spirit. In Cenacles of Prayer the laity gather with the clergy, and with our Lady by praying the rosary, and often celebrate the Holy Sacrifice of the Mass, as they pray for and await the Triumph of the Immaculate Heart, so ardently desired by the Church and promised by Our Lady at Fátima. In the almost three decades of this movement, many tens of thousands of deacons, priests and bishops, including Cardinals, and millions of religious and laity, have consecrated themselves to the Blessed Virgin and pledged fidelity to the Magisterium at the Cenacles of Prayer. In addition, besides the public Cenacles held in parish churches throughout the world, many weekly, bi-weekly or monthly Cenacles are held in private homes. I leave as my spiritual testament everything that is written in the book, "To the Priests, Our Lady's Beloved Sons,” and I attest that the messages contained therein were received by me under the form of interior locutions. Invocation to the Holy Spirit. 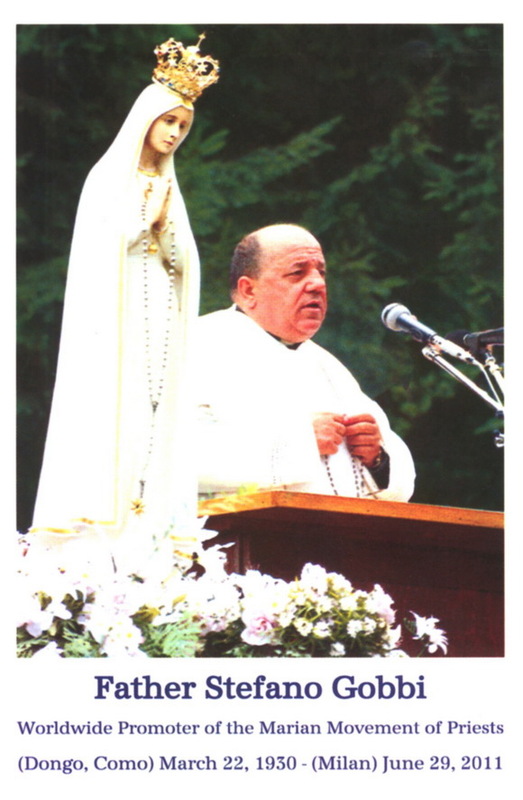 Recitation of five or more decades of the holy rosary. Reading and meditation on one or more messages given in the book, "To the Priests, Our Lady's Beloved Sons."